The Encyclopedia of 5000 Spells, a comprehensive guide to the magical arts, features five thousand spells spanning five thousand years of magical history drawn from Earth’s every inhabited corner, from ancient to modern Egypt, from old Mesopotamia to today’s African Diaspora. There are spells from Celtic, Chinese, Italian, Jewish, Romani, Slavic and Tibetan traditions plus many more. There’s practical magic, high ritual magic, spells that demand careful planning and spells to be cast spontaneously, spells one might wish to cast daily as well as spells that should perhaps never be performed, spells whose components include precious resins and priceless gems and spells whose every ingredient is free: ocean water, moonbeams, dirt. 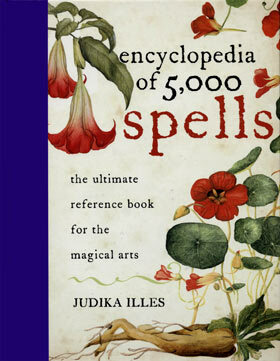 The Encyclopedia of 5000 Spells also serves as a tribute to the magical books of the past. According to many anthropologists, the need to record magic spells and divination results (and taxes!) may have stimulated the very birth of writing. The Book of Thoth has been missing for thousands of years although a version of The Book of Raziel is currently in print. (The original volume, engraved on sapphire, is allegedly beneath the sea.) During the Burning Times, when magical practitioners were burned by the thousands or the millions, depending upon whose count one finds reliable, grimoires too were destroyed and burned, together with alchemists’ texts and witches’ private books of shadows, countless volumes of occult wisdom forever lost in the shadows. The majority of the spells contained in The Encyclopedia of 5000 Spells are traditional spells. Although the Burning Times are over, traditional magic remains under siege in much of the world. Spells are lost daily. In a world of ‘rationalists’ and fundamentalists, ancient Earthly wisdom as well as its practitioners are an endangered species. Magic spells are our common human heritage as are knowledge of magical techniques, whether we choose to use them, whether we wish to keep them on hand for times when they’ll be needed or whether they serve as inspiration and guidance so that we may create our own individual, personalized spells, furthering the evolution of that oldest of human arts, magic.